With my increasing range of toys my scattered workspaces around the house were getting a little cluttered. I had A CNC mill sitting by the sink in the garage, a 3D printer upstairs by the PC and my PCB related stuff in boxes in the dining room. I was very tempted by a laser cutter but had no good space for it. Time for some rearranging! 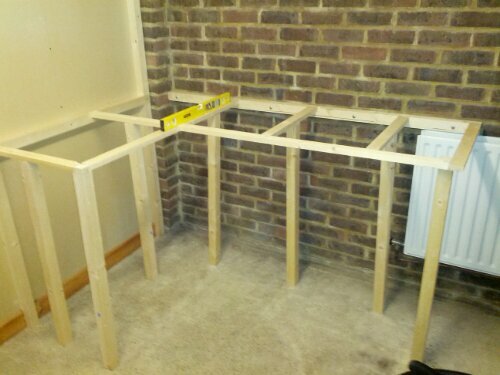 I decided that the best thing to do was rip out some shelving and build a custom workbench. I planned it out as L shaped fitting into the corner of the room on the back of my garage. I went for shelving underneath on both sides and above on the left. It’s strong enough to stand on with no noticeable flex and had a replaceable surface for the inevitable damage it’ll take. 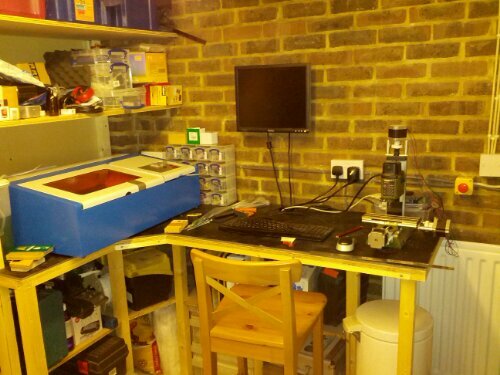 The final result, including my new laser cutter and trusty MF70 CNC mill. On the right you can see an emergency stop that kills all mains power to all the outlets birth above and under the bench. Very much a last resort!